I think the club website is the easiest to use of all the ones I refer to regularly. For some reason (probably with no logical explanation) I find it comes up quickest of all websites. I use it as a test when I think there is fault with my computer or the line is slow generally. The �new� website as I call it has many more sections than its predecessor and I wonder after the few years of its use there may be too many. For instance, I tend to look at the Roadster site first as I have one. There may be a thread going about something that is exclusively to do with Roadsters but sometimes it may have one which refers to a Ford engine which may also concern Berlinetta and Cabrio owners. I would prefer a category headed �technical� because many other problems such as electrics and carbs can be of interest to us all, get me? I particularly like the Build and Rebuild Diaries with the photos and sagas of long term mechanical work. Sales and Wants is a good self explanatory title but some of the other more general categories I feel could be merged, perhaps the committee would like to discuss this. This is a snapshot of the website taken on Monday 23 July 18 at about 08:30. Pitstop Magazines Archived Pitstop Issues Reproduction by physical or electronic means either in whole or part without prior permission of the editor for anything other than personal private use by individual members who already receive the magazine constitutes an abuse of the content and of club membership. I have merged threads before and the result has been rather unsatisfactory. The posts in the merged threads are in strict chronologic order and do make for a coherent read. So I think merging threads is not an option. But I would be happy to �park� some threads, make them read only. I can also start a new thread if required. I believe I can rename a thread too. 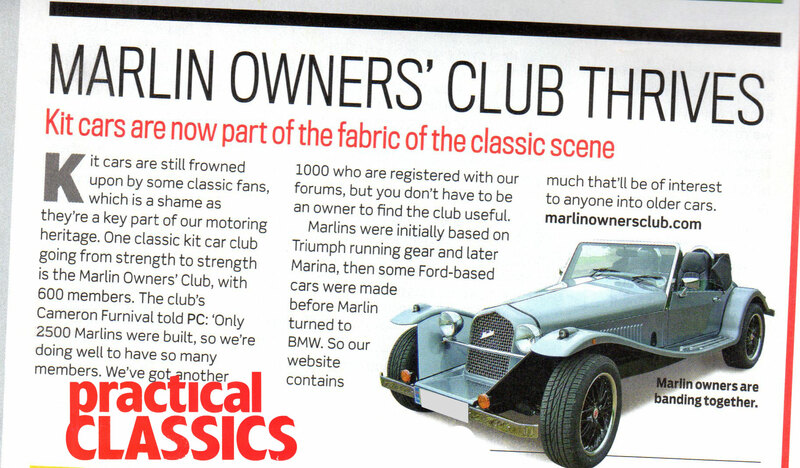 No change to: Roadster, Berlinetta, Cabrio / Hunter, Sportster, 5Exi, Build and Rebuild Diaries and General Car Chat. New members should introduce themselves under the car they own or would like to own. Cars for sale would be listed under their respective heading or items, such as an engine, could be listed under �General Car Chat�. I think �General Car Chat� could be renamed �Technical� to meet Biro�s suggestion of information that is pertinent to all all marques and models. I have to admit I agree with Biro�s sentiment but think �Technical� is a little terse and there might be a better name. Any suggestions? One change I would like is to make the �Build and Rebuild Diaries� is to make them proper blogs that only the builder can add to. Any discussion could be made at the bottom of the diary or other thread. This would allow a coherent read about the car without interruptions or sidetracks. This is beyond my technical expertise but I think it can be done. Help anyone? I think these are fairly strong headings and not sure merging would be beneficial. I guess you might argue that �Meetings and Events� might be covered in �General Discussion�. What do others think? I propose no change to the �Workshop Manuals Tech Tips and Other Useful documents�, �Pitstop Magazines�, �Committee (minutes etc)� or �Club Discussions�. The last one is similar to the �General Discussion� above but is for members only discussions. The �Membership Map� thread is not well used and this topic could be covered under �Club Discussions�. There is a separate menu item to navigate to the map. �Website Discussion� Only four new threads since 2016 and those could have been covered under more general discussions. The �Membership Map� and �Website Discussion� I would park. At the end of the day this is little more than cosmetic tinkering. It is quite a tribute to Cameron and Zest who originally set up the site that after 7 or more years only a nip and a tuck are required. The club and its website are for the benefit of members so I would like to know what the members think. Members are gently reminded that this thread is for the discussion of changes to the web site categories. Spending most of my working life (unfortunately) receiving and sending vast amounts of email on a daily basis, I have always tried to maintain an ordered filing system of archived mail. Recently I think I'm losing the battle, as the volume of information increases and search facilities improve in later versions of outlook. MAybe a similar philosophy could be adopted on the website. Thread classification in groups is probably less of an issue as long as we can find what we want via a cross group search. Keeping the structure as simple as possible will reap benefits in the long run. BTW I rarely go looking in groups, just use the recent posts option, as there's interesting information in all sections. On the whole I agree with the above and thank biro for the constructive thoughts. One small concern would be losing the ability to comment on build threads directly, I think its really important to offer both advice and even more importantly appreciation and kudos to builders a long the way. I'm sure people are incentivised to write more and push on, with the odd word of support with like minded individuals of which there are many around on these pages. Final point is an observation based on my occasional lurking in one of the Vw forums (https://www.volkswagenforum.co.uk) which appears to be based on an identical platform to ours. It gives the ability for members to both like, and importantly dislike posts of other members. Meaning that inappropriate unpopular comments are recorded, without the need for written retaliation. The behaviour rules on the forum could then be reviewed and objective criteria built in as to how to treat such members posts. I have stopped myself remarking on several occasions knowing that it rarely improves the situation. But neither does it give feedback to the originator. And I do realise there is a report post option, but I doubt it gets used except in extreme cases. I'm all for people having their say, having different opinions etc. But done in a way that is constructive. Some of have forgotten why we frequent this website, shared love of the marque.etc. If things are less than 100% perfect in the website or anything else, it's not going to be something I feel the need to fall out with anyone about ! Anyway team, keep up the good work. Take my thoughts with a pinch of salt & get out there and enjoy your cars be they in the garage or on the road ! Last edited by 928cdu; 02-08-2018 at 12:41 PM. On the subject of the web site, on the picture stream has anybody else noticed there is not a Sportster? Last edited by stevepritch; 07-11-2018 at 05:21 PM. What would you like to see in the new website?